The African lion is one of the four roaring cats. Their roar, which can be heard more than 5 miles away, is used to communicate with other lions and to help mark territory, not to scare prey. 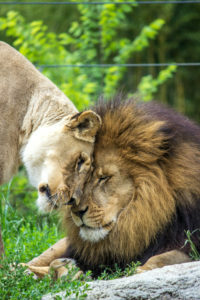 The thick manes on adult males serve as protection for the cats when fighting over prides or when defending territory. They spend an average of 15 to 22 hours a day resting and sleeping.